You must stop at all stop signs and red lights. A scooter is considered a vehicle by state law. The rider must keep the scooter under control at all times, and is responsible for avoiding collision with pedestrians, bicyclists or vehicles. Scooters are hard to see, so be defensive. Don’t assume the driver of a car will be able to see you. Wear a helmet at all times. Having your head hit the pavement (or a tree or sign post) at even 10 miles per hour can be fatal. Stop, look and listen before you cross a street. Use the scooter for transportation, not durability testing. Don’t try to perform tricks on the scooter. Not only do you risk injury to yourself, you also risk being charged for any damages that result to the scooter or other property. Keep electric and gas-powered scooters outside at all times. They can be a fire hazard when inside, and are prohibited in NMSU buildings. Park scooters in designated spaces or out of the path of others. Avoid leaving them in front of doorways, across walkways, blocking disabled ramps, etc. Look out for grates. Unlike bicycles and mopeds that can ride over sewers and grates with ease, these electric scooters have tiny wheels that can get caught in the spaces. 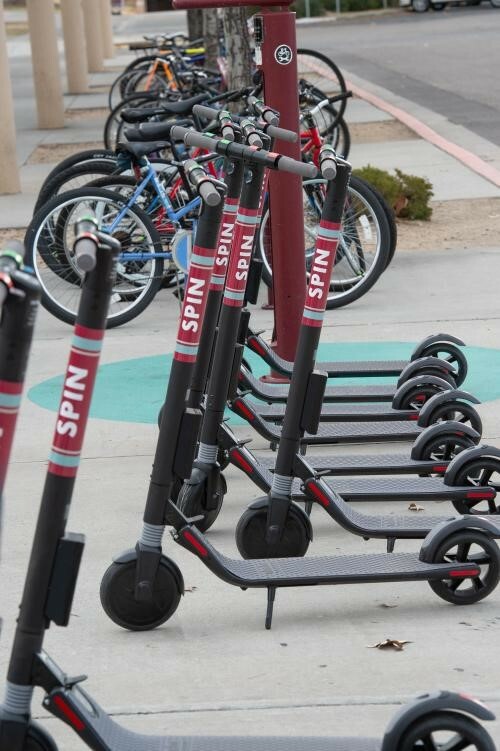 If your scooter gets caught, you could very well end up flying over the handlebars. Avoid sewers and grates if you can. Scooter drivers must obey all traffic signs and signals and follow traffic laws. You must ride with the flow of traffic. Do not travel the wrong way in a bike lane or on a street. You must yield to pedestrians at all times. When passing pedestrians, slow down and allow plenty of clearance. Operate within bike lanes when available, on streets and on designated campus sidewalks and shared-use paths (except in heavily congested pedestrian areas). Operators must dismount in heavily congested pedestrian areas. 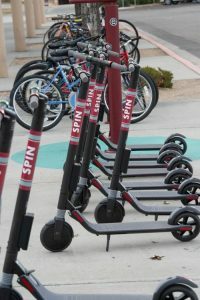 Scooters are prohibited in any campus building or on elevated pedestrian walkways. Only operate scooters on paved surfaces. Headlights and reflectors are required for operating scooters in low light conditions- either on the operator or the scooter.